With the arrival of the 1860's, Green Bay was booming. With over 35 sawmills operating at the mouth of the Fox River, the town of Green Bay was fast becoming one of the Great Lakes preeminent lumber shipping ports, and the peninsula communities of Fish Creek, Ephraim and Sturgeon Bay were also growing as they shipped fish, lumber and stone throughout the Great chain of lakes. Vessels entering Green Bay from Deaths Door quickly established two separate southbound lanes dependent on their destinations, with Chambers Island serving as a critical landmark for both. Vessels bound for the peninsula harbors took a narrow passage known as the Strawberry Channel immediately to the east of Chambers Island, while those headed to the foot of the bay swung southwest out of Deaths Door' taking deeper water to a point west of Chambers Island, where they swung south to Green Bay. As a result of pleas from maritime interests for the improvement of aids to navigation in the western Great Lakes, the Lighthouse Board dispatched a special committee to evaluate navigational needs in the area in 1865. As part of its evaluation, the committee recommended that lights be established on Whaleback Shoal (now known as Peshtigo Reef), Grassy Island and on Chambers Island. Congress responded with an appropriation of $25,000 authorizing the construction of these lights on July 28 of the following year. However the Board quickly recognized that the amount of the appropriation was insufficient, as their latest estimates indicated that $15,000 would be needed for the construction of a light on Chambers Island alone. With no additional appropriation forthcoming, and deeming the need for a light on Chambers Island to be critical, the Board decided to move ahead with construction on the island, while delaying work on the other sites until additional funds could be obtained. In May of 1867, a 40-acre reservation on the north end of the island was purchased from sawmill owner Lewis S. Williams for the sum of $250. Williams had been born in New York in 1821, and had moved to Mackinac Island with his family around 1840. Lewis & his wife Anna Hoag moved to Chambers Island in 1850, following the footsteps of Anna's father, who had been the first permanent settler on the island in 1848. With the delivery of materials and a working party, work began on the island the following June. The plans for the Chambers Island Light Station called for a virtual twin of the structure being built that same year at Eagle Bluff, with one important exception. While the light at Eagle Bluff was designed with a square tower, this tower was to be octagonal in plan, in order to visually differentiate the two structures and reduce any potential confusion to mariners. Built atop a cellar excavated in the rough gravel that constitutes the island, the Cream City brick structure's forty-two foot tall tower was diagonally integrated into the corner of the dwelling. 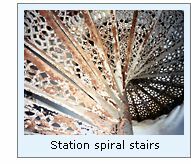 A circular inner brick wall within the tower contained a set of 55 cast-iron spiral stairs which wound from the cellar to the lantern. With landings on the first and second floors, these stairs also served as the only method of moving between the floors within the dwelling. The tower was capped with an octagonal gallery on which a decagonal prefabricated iron lantern was centered. The clockwork mechanism rotated the station's Fourth-Order Fresnel lens to provide a characteristic fixed white light varied by a flash every sixty seconds, and it's 68-foot focal plane provided a visibility range of sixteen miles on clear nights. While most keeper's were promoted to the position of keeper after previous service as assistants, Lewis Williams was appointed directly as the station's first keeper. It must be remembered that these were days of politically expedient appointments, and it is likely that William's sold his land to the Government with the understanding that he would be appointed as the station's first keeper. Williams, his wife, and their eleven children moved into the dwelling, and carefully threading the family bedroom furniture up the tightly-spiraling stairs. Williams exhibited the new light for the first time on the evening of October 1, 1867. 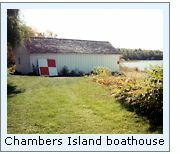 In 1892, as a result of falling lake levels, the station's boathouse was relocated 16 feet closer to the receding shore, and a new landing crib was built. Sidewalks were replaced and a 45-foot deep well with a windmill-powered pump and a 2,250-gallon holding tank were installed, bringing running water into the dwelling for the first time, and eliminating the need to draw water from the lake on a daily basis. Evidently, the water levels in Green Bay continued to decline, as the boat house was moved 75 feet further toward the shore in 1897. The Lighthouse Board decided that the characteristic of the station's light needed modification, and a new Fourth Order lens, clockwork and pedestal with a mercury float were delivered to the station in 1898. The Ninth District Lampist arrived and installed the mechanism in the tower the following year. Exhibited for the first time on the night of July 15, 1899, the virtual friction-free rotation resulting from the mercury float system allowed the new lens to be rotated at twice the speed of the original mechanism, providing the new characteristic of a fixed white light varied by a two-second flash every thirty-seconds. Life for the keeper improved dramatically in 1926 when an acetylene illuminating system was installed in the tower. Equipped with a sun valve, the acetylene gas was automatically turned on at night and off at dawn, and with no wick, required significantly less observation and maintenance during the night. 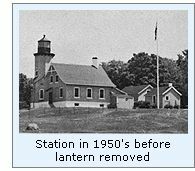 The US Coast Guard assumed responsibility for the nation's aids to navigation in 1929, and in an attempt to reduce cost automated the Chamber's Island light in 1955 through the removal of the lantern from the gallery and the erection of an electrically-powered light atop a 30-foot steel skeletal structure in its place. The Coast Guard constructed a 67-foot steel tower between the shore and the station in 1961. Painted black and outfitted with a diamond-shaped daymark, the tower is equipped with a modern solar-powered optic, and displays a flashing white light every six seconds, visible for a distance of 12 miles. With construction of this new steel tower, the pole was removed from atop the original structure, and the old tower stood dark at night after ninety-three years of faithful service. The Coast Guard deeded the lighthouse reservation and buildings to the town of Gibraltar in 1976, for use as a park, and the lighthouse was opened to the public the following year. Joel and Mary Blahnik and their family have lived in the keepers dwelling every summer since, and have worked at restoring the buildings and creating a museum within the keeper's dwelling. It has been widely reported that the Fourth Order lens assembly from Chambers Island was sold to Harold Warp of Chicago in 1958, and was subsequently displayed in his Pioneer Village museum in Minden, Nebraska. However, during their August 21, 2001 visit to Minden Al and Helen Gademsky of the Fresnel Research Team found that while the Pioneer Village had three Fresnel lenses on display, all three of them were Sixth Order lenses, and thus could not have come from Chambers Island. 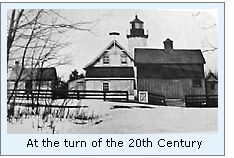 Click Here to see a complete listing of all Chambers Island Light keepers compiled by Phyllis L. Tag of Great Lakes Lighthouse Research. Unfortunately, our hectic field trip schedules have thus far prevented us from visiting this light. The deeding of the grounds to the town of Gibraltar in 1896 serves as an early example of the successful transfer of ownership to a local entity. With interest in lighthouses increasing, and the population becoming increasingly aware of the historical importance of these magnificent structures, we can dream that some day funds will be obtained to fabricate a new lantern for the tower, and return the station to it's original glory. The station is open to the public on most days, however the only way to get out to the island is by private boat or via a charter captain. Author's discussions with Eagle Bluff docent during 2000 field trip. Coast Guard Historian's office archives. Great Lakes Coast Pilot, NOAA, 2000. 09/11/01 email from Al & Helen Gademsky on their visit to Warps Pioneer Village. Michigan State Archive, Lighthouse photography collection.